A person who engages in warfare. In stratified armies, warrior can refer to a specific rank, or it can merely refer to one who fights with no predefined role. 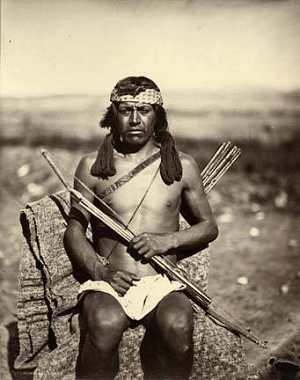 "Jose Antonio Vigil (Potshuno), Nambé Pueblo warrior, New Mexico," photograph by Hillers, John K.. Palace of the Governors Photo Archives Collection (055217). Palace of the Governors Photo Archives. All Rights Reserved, Used with permission.